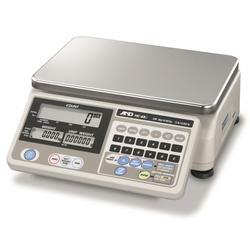 The AND Weighing HC-I Series digital counting scales offer simple and easy operation with high performance counting function. With the AND Weighing HC-i series counting scale and its accessories you can easily build an inexpensive inventory control system. The AND Weighing HC-I Series digital counting scales offer simple and easy operation with high performance counting function. With the AND Weighing HC-i series counting scale and its accessories you can easily build an inexpensive inventory control system. The AND HC-I counting scales are cost effective and will improve reliability by eliminating errors and unnecessary repetition during large volume counting jobs. With the HC-i series and its accessories, you can easily build an inexpensive inventory control system. The HC-i series is cost effective and will improve reliability by eliminating errors and unnecessary repetition during large volume counting jobs.